The Last Straw campaign is gaining ground with many restaurants in Umhlanga alone no longer offering plastic straws. Alternatives to plastic, too, are growing in popularity. One of these alternatives is bamboo. 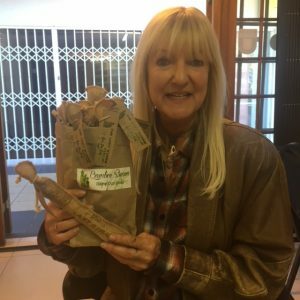 Carol Mackintosh from the Wilderness in the Cape has a company aptly named The Last Straw which makes reusable straws from bamboo. The straws and the bamboo cleaning sticks for the straws are all harvested from local bamboo, using local labour. Nothing is imported. The bamboo growing in the Wilderness Lagoon is harvested, then cut to size, dried in the sun, sanded and sanitized. The straws are made in different diameters and are therefore suitable for all types of drinks from sodas to milkshakes and cocktails. Straws can be purchased as they are or in hessian pouches accompanied by a bamboo cleaning stick. The pouches come with The Last Straw label and contact details but Carol encourages people to create their own labels and stamps. By doing this organisations can use the labelled straws for celebrations, promotions, gifts etc. Carol, who lives on a free-range chicken farm in the Cape, now employs between four and 11 local people in the straw-making process. The pouches are made by a local church (The Hope Church), and harvesting the bamboo assists San Parks by removing the invasive bamboo from waterways. Support this wholly South African venture and save our seas from plastic pollution. Say Yes to Bamboo straws! Straws in pouches are available from the Umhlanga Tourism office for R20 each. Alternatively, contact Carol Mackintosh on carolmackintosh9@gmail.com or 079 174 1489 to place your order. Follow The Last Straw on Facebook https://www.facebook.com/thelaststraw101/.